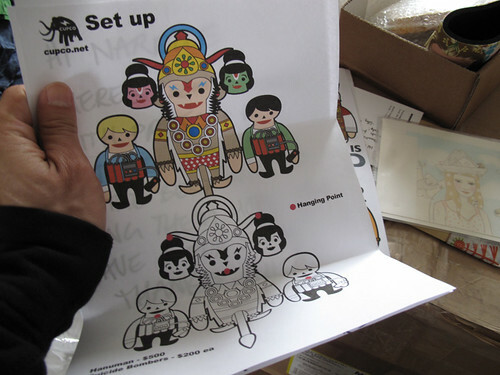 These are the instructions for CUPCO’s installation for our show at Robio on November 7th. CUPCO has some crazy plush. This piece, a deity in the middle and two suicide bombers. This is some crazy sh*t. I guess the postal service in Australia is good too, they just sent this in bubble wrap, taped up. That would have fallen to bits in the US. But, it got here nice and fine. If you are in Melbourne, come down and have some fun with us. Poketo Aussie Series Artshow at Robio, all the new Poketo wallets, and an afterparty down the street.